Geoffrey Nash is Senior Lecturer at the University of Sunderland. He is the author of The Anglo-Arab Encounter: Fiction and Autobiography by Arab Writers in English; Writing Muslim Identity; and co-editor of Postcolonialism and Islam. This book looks at the first generation of Arab British and Arab American writers to produce English writings in the earlier twentieth-century: Ameen Rihani, Khalil Jibran, George Antonius and Edward Atiyah. It theorises their work within the context of Arab nationalism, postcolonialism and the criticism of Edward Said. 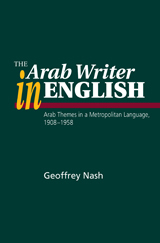 Geoffrey Nash’s The Arab Writer in English and his The Anglo-Arab Encounter…together offer the most detailed study to date of Arab British literature. By the end … the reader… feels their perspective on Middle East history and writing has been extended…Overall Nash builds a sensitive, engaged, and highly intelligent awareness of his subject. All who are interested in the varieties and complexities of the relationship between the Arab world and the West in the twentieth century should consult it and ponder the issues that it so provocatively raises. An innovative book which will be of great interest to anyone working in comparative literature or post-colonialism. Nash examines the English writings of four 20th-century Arab writers, all of whom were Lebanese Christians but, with one exception, lived outside of Lebanon. They inherited the mantle of cultural mediation from generations of Arab Christians, he says, but instead of mediating Western culture to Arab Asia as their predecessors had done, they mediated Arab culture and political concerns to the West. The writers are Ameen Rihani, Khalil Jibran, George Antonius, and Edward Atiyah.